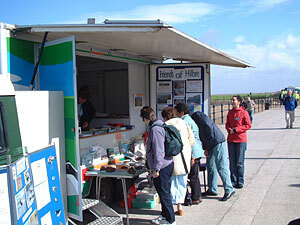 The Friends of Hilbre attending the Mobile Information Unit at Hoylake during the August Bank Holiday Lifeboat Day, 2004 (left). The Friends of Hilbre volunteers work in cooperation with the Wirral Ranger Service and staff the Mobile Information Unit (MIU) once a month at the Dee Lane slipway, West Kirby, for the benefit of the general public. We also attend other events. Educational displays are mounted regarding the work of The Friends of Hilbre, the wildlife and the history of the Local Nature Reserve. Members of the public are informed of our aims, the necessity to protect the wildlife, to conserve the Victorian buildings on of the islands, and the safety measures to take when planning a trip to the islands. There are various sale items available including Information Sheet Packs re Hilbre, booklets, pictures, cards, fridge magnets, keyrings and bookmarks – these items help to raise funds for materials and services on Hilbre.